Want fresh, homegrown food, regardless of climate and season? Don’t have a suitable space to garden outdoors? 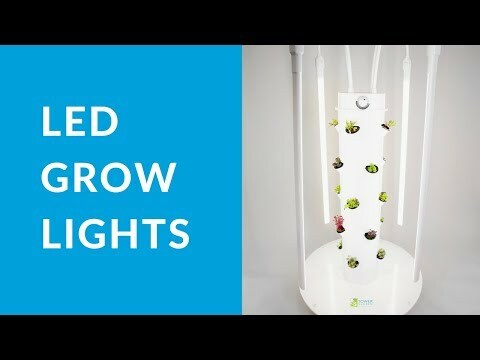 The Tower Garden Grow Lights Kit* allows you to easily grow leafy greens, herbs and other non-fruiting crops indoors year-round. *We do not recommend growing fruiting or flowering plants (ex. tomatoes) with grow lights. Check out our assembly video. The TG LED Grow Lights Kit is rated at 1 amp, 125 watts, 120 VAC/60 Hz. Assuming you run your grow lights for the recommended minimum 14 hours per day and your power company charges you 12 cents per kilowatt hour, the cost to run those lights would come out to roughly $6.39 per month, or $76.70 per year. Note: These numbers are TYPICAL, AVERAGE and APPROXIMATE. They are based on 12 cents per Kilowatt hour. Your actual costs will vary. The annual per kilowatt cost number is the best one to use for these calculations as power utilities often apply different rates at different times of the year.